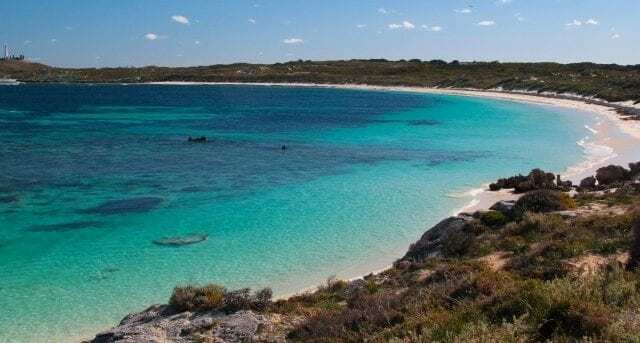 Wardan Nara Bidi is a 10km, grade 4 One Way hike located in Rottnest Island Western Australia. The hike should take approximately 3hrs to complete. Wardan Nara Bidi begins with a gradual climb up the hillside behind Parker Point. The slight increase in energy exertion is well worth it, as the views from the top are spectacular. There is a strategically placed bench at this spot to allow you to catch your breath and take in the incredible 180° views along the south coast of the Island. Continue on and explore Parker Point and Little Salmon Bay. Both of these bays are protected and prove very popular snorkelling spots. Stroll along Salmon bay, drinking in the sprawling turquoise waters. Then use the trail to cross over land to Oliver Hill! The military history of Rottnest is marvellous. Experience newly restored World War II guns and dare to venture down in to the tunnels. The trail links Oliver Hill to Wadjemup Lighthouse. The Rottnest Voluntary guides are on duty 365 days a year at both of these sites and for a small fee will take you on a fabulous informative tour. Dive in to the depths of the tunnels at Oliver Hill, and then climb to the top of the Wadjemup Lighthouse, which is the highest point on the Island. The 360° views from the top are worth the 155 step climb! Please note that these buildings can only be entered accompanied by a voluntary guide. Heading on west, across the Rottnest borefields, you will find yourself at the world class surf break known as ‘Strickos’, on Strickland Bay. The trail then meanders through the Acacia scrub and pops out on to the craggy limestone shelves along Strickland Bay. The final delight along this trail is the impressive Mammong sculpture, designed and created by Aboriginal artist Peter Farmer in 2016. The flashes of the flukes in the sunlight are a marvel. Reaching Narrow Neck you can decide to continue your journey west, or to explore the north coast on the Karlinyah Bidi. This trail is one of 5 sections which make up the 45 Wadjemup Bidi network and links with both Ngank Yira Bidi and Gabbi Karniny Bidi. Start Point: The Wadarn Nara Bidi can be walked east to west, or vice versa. Starting at Porpoise Bay bus stop or at Narrow Neck bus stop.